After many months focused on historic beer research and beer travels, I'm stably back home (BC, Canada) and am back to brewing. The blog's facebook page has been actively reflecting this with photos, partial recipes and process info, but it's time to put some of the new brews up on the blog itself. My latest brew excluded, my activity so far has focused on brewing and re-brewing two basic recipes - a grisette and a 1.030 OG saison. Through posts, interviews and presentations I've put forward a lot of my recent thoughts on grisette (see these posts, an AHA presentation if you are an AHA member, this interview with Basic Brewing Radio, and this interview with Fuhmentaboudit!) so this post will focus on low-strength saisons. These are some of my favorite beers to drink and with the warm weather of summer when I returned to brewing they are what I've wanted. When I think about commercial low-strength saisons, one primary example comes to mind as my clear favorite - La Petite Princesse from Brasserie Thiriez. Regular followers of this blog and friends of mine will known I am a vocal proponent of this beer. This brew started as a collaborative brew with Jester King (following their Le Petit Prince closely) and Daniel continues to brew it. I love how refreshing this beer is and how it carries way more flavor than you would expect from a ~1.020-1.025 beer. Of course there are other great examples out there (including the Jester King beer, which is great but unfortunately I am much less familiar with it, and Brasserie Dupont's Biolégère/Avril). Unfortunately none of these examples are especially widely available, at least fresh examples. So if you're curious about this sort of beer but you can't find a commercial example, either local or imported, then you may just have to try brewing your own. I broke down my thinking in building a low-OG saison recipe in this recent post discussion my recipe formulation process. All of the goals and general plans for the brew are outlined there so here I'll jump into the recipe. Malt #46 - Concerto barley. Grains and mashing: Before getting into recipes/brewdays I want to spend a bit of time focusing on grain and mashing, both because I made very deliberate and potentially unique choices in this beer and because I am using malts that are not available to a wide audience. I am now almost exclusively using locally grown and malted barley for my base malt in all my brewing. This malt comes from my friend Mike who runs a small floor maltery (Doehnel Floor Malting) and who is involved with Skagit Valley Malting. While this may mean some of my malt specifics might be less useful to an audience that can't get these malts, I'll try to provide a bit more detail about the malts. Hopefully the end result of this is more thinking about/knowledge about malt that couldn't be gained by simply listing a style or internationally available commercial producer. I've been using Doehnel batch #46 as the base malt for my recent low-OG saisons. This malt is made from Concerto barley (a spring 2 row variety). It has a very thin husk and a lightly colored blue aleurone (which you can sort of see in the photo). Although it is kilned to around a pilsner level in terms of color, it is richer and tastes somewhere between pils and vienna. The FAN is fairly low, which makes it suitable for more intensive mashing procedures. The friability is in between pilsner and North American malts and the difference in extract between coarse and fine grind is low, suggesting a fairly well-modified malt (a good amount more modified than what I've been using for grisettes). So to sum that up, very light color but rich flavor, low FAN so I'll want to address that in mashing, and pretty good modification. Without analyzing spec sheets, if you were to try to come up with a similar base malt from commercial varieties maybe consider a more characterful pils like some of the special pils malts Weyermann has (Barke and/or floor malted), or blending in continental European pale malts and/or Vienna with your base pils. Based on discussions with Mike and the malt I've been able to get form him, I've had the opportunity to work with more intensive mashing procedures. I feel like I am getting a good graininess out of this (turbid wort tastes unlike any wort I've tasted from a normal mash), and I think it is helping me to brew very light beers which don't seem to be lacking malt character and complexity. But I can't approach the tastings in an unbiased way and I haven't done any comparisons with the same recipe made from normally mashed wort. Anyway, the opportunity to get a bit more involved in mashing leads me to the inspiration on that side - historic texts. My recent low-OG saisons take inspiration from a text written by George Johnson in 1918 (see this post for a discussion of that text) as well as other historic texts such as Evans, 1905 (as discussed in this post) discussing turbid mashing for a wider range than considered by most in the modern world (the original historic texts are also linked in both of those posts). Johnson's text promotes turbid mashing as a technique that is desirable for producing low-gravity beers of fairly rapid turnaround. This is different from turbid mashing in lambic, where a major goal of turbid mashing is to provide carbohydrate and nutrient sources for a diverse range of microbes with diverse metabolic capacities and needs over a long time. 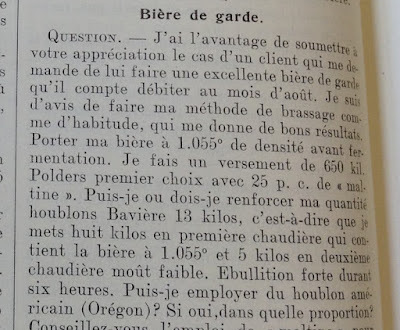 But there is reasoning for Johnsons's advice - lower attenuation and the additional extraction from turbid mashing would work well, at least in theory, in low-OG beers. So I wanted to try it out. I won't discuss mashing in length here as that is covered in this post focused on Johnson's text (this was also linked to above). In brief, this is a turbid mash with one pull of turbid wort (more are optional). There is a beta glucan rest around 108 F / 42 C which is rather dry, a protein rest around 125 F / 51.7 C, and a saccharification rest around 156 F / 69 C. The turbid pull comes between the second and third rests and optionally spends some time at a saccharificaiton rest while it is heated to boiling. After the main mash is drained the turbid portion is added back and allowed to rest at a high saccharification temp for a fair amount of time. This is then drained and the grain is sparged more or less as normal. Just after turning the flame off and adding whirlpool hops. I'm used to a 'Cantillon-style' turbid mash and am comfortable with that, but this was my first time I've used a turbid mash modeled after Johnson, 1918. Things went generally smoothly, but as with any somewhat complicated process that you try for the first time, it didn't all go exactly as planned. My turbid pull didn't get as much time at a saccharification temp before boiling as I would have liked, and in general I didn't hit my target temps as closely as desired. This probably influences the lower than expected attenuation, but the beer doesn't taste sweet or heavy and I'm pretty happy with how it came out. I suspect more experience with this mash and a bit more focus on brew day will help for next time. Hopping: ~1 g/l Sterling pellets to bitter with 30 min left in the boil (calculates out to a contribution of 21 IBU, but from brewing with this same sterling before I think it is closer to 10-15), and ~5 g/l Hallertau Tradition whole hops at flame out for a 25 minute hop stand/whirlpool. The end result is a calculated 40 IBU but I think it is more likely on the 30 side. And the hopping, as is clear from this recipe, is balanced toward the flavor side rather than bitterness. Fermentation: I used yeast cultured from a bottle of Thiriez beer. This is what I've been using in most of my beers lately and I quite like it. I've talked a fair bit about this yeast but, in brief, it is different from Wyeast 3711 in fermentation behavior/appearance, attenuation, and flavor/aroma profile. If I am going to use a single yeast strain then this is the one I want to use. The carboys fermented in the low 70s F / ~22-23 C. The beers were given on the order of a week for primary and then one carboy was racked onto ~1 g/l Styrian Golding pellets. This beer was given 6 days of contact time at room temp. The non-dry hopped version was bottled 12 days after brew and the dry hopped was bottled 14 days after brew. This is a bit longer than I've been giving other similar beers recently based on my schedule/availability. I've generally been shooting for around 10 days brew to bottle, with both dry hopped and non-dry hopped beers. The beers were given a couple weeks conditioning at room temps (so for me that is around 64 F / 18 C, I'd like to condition a bit warmer) with corked 750s conditioned horizontally. After the conditioning time the beer was moved to a cooler room and the horizontal bottles were put upright or left horizontal, depending on what storage space I had open for them. I'm quite happy with how the final beers came out, especially the dry hopped version. Perhaps I'll put up some tasting notes in the coming week(s). Thanks for the write-up! I will be trying something similar to what you've done over the holiday, doing a 5-gal turbid mash and after a couple hours' boil with minimal hopping I will run off a portion to be fermented by the yeast/bacteria cake I saved from a spontaneously fermented cider just bottled, and the remainder I'll dilute and continue to boil another 45 or so minutes after some further hopping. That portion I'd like to ferment into something similar to your small saisons - I was thinking WYeast 3724 since I'm limited to shelf yeast options right now, and once activity starts I'll open ferment (with cheese cloth) for a period of time to try to avoid the 'stall'. It'll be my first turbid mashed brew! Thanks Jason! And sorry for the delay in my response. I was out at sea starting in mid Dec and only returned home yesterday. Hope the brew went well if you've had a chance to do it already and hope it goes well if not. I like the character of 3724 and I used to use that as the primary component of my yeast blend for saisons, so I think if you've got access to that then you're good. I remember my first turbid mashed brew being a bit of a mess with running around trying to hit steps, but things smooth out after a couple runs through the process. And it is fairly forgiving. Let me know how it turns out! Cheers and thanks for following the blog.